BEDFORD, MA--(Marketwired - Nov 1, 2016) - Diversified Technologies, Inc. (DTI) has introduced a compact solid-state high voltage DC power supply that provides high efficiency and reliability in a single small enclosure. The DTI 250 kW HVPS Series Switching Mode Power Supply is a compact, fully integrated solid-state unit that provides 15 to 100 kV adjustable output with > 92% efficiency and > 100,000 hours MTBF (mean time between failures). 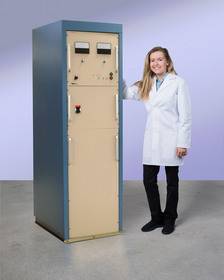 This high voltage power supply is packaged in a 24" W x 36" D x 74" H cabinet, uses tap water for cooling, and eliminates the complexity involved with connecting and controlling multiple smaller switching power supplies. Suitable for a wide range of industrial and research applications, the DTI 250 kW HVPS Series Switching Mode Power Supply can be configured to user requirements. Featuring < 0.1% ripple and regulation with < < 10 joules stored energy, depending upon configuration, it offers full over-voltage and over-current protection up to +30% or preset to ±0.1% max. ripple. The DTI 250 kW HVPS Series Switching Mode Power Supply is priced from (USD) $195,000.00 with custom configurations available. Price quotations will be provided upon request. Diversified Technologies, Inc. is the developer and marketer of the PowerMod™ line of high voltage, high power pulse modulators, DC power supplies, and control systems. The firm's products are used worldwide in high power applications such as radar, high energy physics, defense, and food processing. Selected several times by "R&D Magazine" as one of the 100 most significant products of the year, DTI's PowerMod™ systems are available in a wide range of voltage, current, and performance configurations. About this company Diversified Technologies, Inc. The DTI 250 kW HVPS Series Switching Mode Power Supply is a compact, fully integrated solid-state unit that provides 15 to 100 kV adjustable output with > 92% efficiency.